Season the chicken pieces with salt and pepper. In a large saucepan, add the olive oil, onion, garlic and bay leaf. Stir and let it heat well. As soon as the onion begins to glaze, add the chicken pieces. Cover and cook over medium heat until the meat is cooked, without browning. Turn the meat over and let it brown evenly. When the chicken is golden brown, add the white wine and chicken broth. Cover and cook over medium heat for 40 minutes. With a spoon, mix the flour with the yolks. Gradually add the lemon juice. After 40 minutes, lower the heat and add the parsley. Finally, add the flour dissolved in the egg yolks and stir quickly. As soon as it thickens and before it begins to boil, turn off the heat. 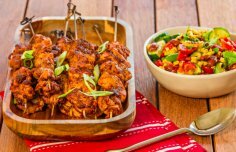 How to make Portuguese style chicken kebabs. 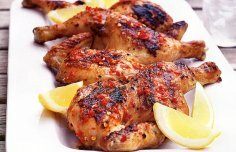 How to make simple and easy Portuguese BBQ chicken. 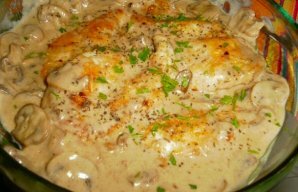 This delicious Portuguese chicken steaks with mushrooms recipe (receita de bifes de frango com cogumelos) is very easy to prepare.